We provide a full range of energy savings advice, tips and programmes to help our customers to reduce their energy usage by being more efficient. An installation of energy efficient lighting provides enough light to the related area and application whilst using the least energy possible. Most buildings offer users some levels of savings opportunities. Depending on the light fittings in place for the application many buildings can offer huge savings by retrofitting old lights with new and more efficient fittings. The first step in assessing your lights usage of power is by installing a BEMS (see BEMS section) or by carrying out an audit of your site. Simple steps may help users reduce their consumption without any investment. In offices lighting can account for around 50% of the money spent on electricity. Turning off lights when they are not needed is an effective way of saving money. Simple management practices and audit procedures can provide a cost-effective way of improving your energy consumption ensuring that you only use the energy that you need to use. Encourage people to turn off lights when they leave an area. Ensure that lights are switched off when buildings are unoccupied. Ensure all lights in store cupboards/plant rooms or other areas that are not normally occupied are switched off. Make sure people can easily identify which switch controls his or her lights. Install Occupancy Sensors in rooms that are only used from time to time. Light trimmers can be used to automatically lower lighting levels optimising any natural light that may come into your business – this can have a significant effect on your lighting load..
Review lighting levels in different building areas to ensure it is adequate for the activity in the space e.g. corridors are often over lit. Make the best use of daylight coming through your windows and roof lights. Look at any areas in your business where the lights have not been replaced for some time – perhaps there is better more efficient options that you can use when it comes time to replace the fittings. Ensure all light fittings are cleaned every year. Motors and Drives are typically a major user of electricity and power in commercial and industrial installations. Motors are used in applications across most installations and are often overlooked for energy measures as they are considered essential pieces of equipment and must be left active for plants operational activities. There are some small low or no cost measure that users can adopt to minimise the usage of machinery in their industrial process. All machinery should have an operating schedule attached to it so operators know if and when it should be turned off. Use an hour's run meter to measure how long equipment has been running and compare with the required hours of operation. Reduce the operating time of motors whenever possible by improving control of motor driven loads and switch them off either manually or automatically when not required. Have a schedule and procedure for motor maintenance and ensure staff promptly report faulty or noisy motors. Have a plan for repairing failed motors, which compares long-term repair vs. replacement costs. Match the right size motors to the right loads ensuring that they are typically on 75% loading. The 'loading' of a motor is the amount of work it does compared with its capability. A Variable Speed Drive (VSD) is a system that can control rotational speed and torque on an AC motor by adjusting the power supplied to the motor to match the load requirement. A small reduction in the power load can have significant benefits for the consumption of electricity on sites motor installations. 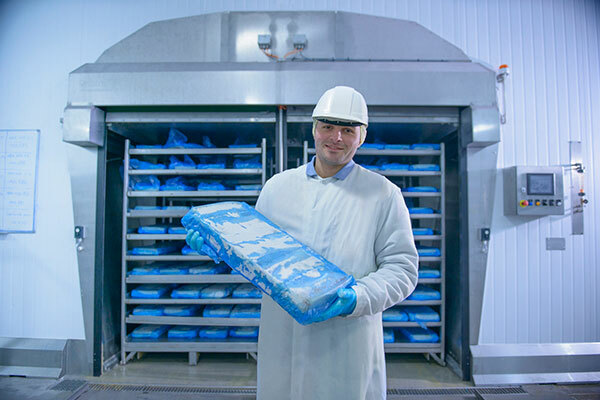 Industrial and commercial refrigeration systems are most efficient when the evaporator absorbs as much heat as possible (from the chilled space) and the condenser can release as much heat as possible (normally to outdoors) and the refrigerant flows efficiently between the two. Refrigerators and freezers should be located away from heat sources. Check and maintain strip curtains on walk-in refrigerated spaces. Ensure seals and gaskets are in good condition. Check air flow around refrigeration units and remote compressors to ensure that they are not obstructed and that grilles are not blocked. Service refrigeration system and components, and calibrate controls yearly.